Get ready for a new phase of the Obama presidency. Washington—Be ready for the paradoxical phase of Barack Obama's presidency. Many things will not be exactly as they appear. Paradox No. 1: Because over the next two years he can't get sweeping, progressive legislation through the Republican-led House, Obama will be doing far more to make the core progressive case that energetic government is essential to prosperity, growth, and equity. Paradox No. 2: His talk about the new, the bold, and the innovative is in the oldest of political traditions. The Obama of Tuesday night represented not the rambunctious liberalism of the late 1960s but the unifying, John Kennedy-style liberalism of the decade's beginning—with a dash of Dwight Eisenhower moderation. Obama also sounded like a Whig, the insufficiently appreciated nineteenth-century American political party that proudly included Henry Clay and Abraham Lincoln. Paradox No. 3: Obama used a conciliatory speech to pick some carefully chosen fights. It will be amusing to watch Republicans defend the oil companies' tax loopholes that Obama would like to scrap. Paradox No. 4: It may never be clear if American business is co-opting Obama, or if Obama is co-opting business. The greatest shortcoming of Obama's first two years in office was his failure to take Americans back to first principles and tell a credible story about how his approach to governing would move the country forward. The administration's alibi was that it had too much to do to waste time on what the president dismissed as "politicking." The era of no politicking is over. This speech laid out a rationale for the Obama presidency that stands a chance of enduring through Election Day 2012. The choice is between backward-looking Republicans who talk grumpily about government spending and "Obamacare," and forward-looking Obama Democrats who would use government—carefully and efficiently, of course—to restore American leadership and a humming, innovative economy. This Obama is all about balance. Notice that when he spoke of making regulation less intrusive, he actually defended rules protecting our food, water, and air. His overarching case was also nuanced. "Our free enterprise system is what drives innovation," he said. "But because it's not always profitable for companies to invest in basic research, throughout our history, our government has provided cutting-edge scientists and inventors with the support that they need." This speaks to the paradox of Mr. Innovation operating in a very old tradition. When they want to look modern and moderate, progressive political parties always talk about technology. Seeking to become Britain's first Labour Party prime minister after years of Conservative rule, Harold Wilson spoke in 1963 of the "white heat" of a technological "revolution." Kennedy pledged to "get the country moving again," and sent us to the moon. And it was Eisenhower, president during the original "Sputnik moment," who pushed through the interstate highway system and federal student loans, early efforts to "out-build" and "out-educate" the world. Let's also honor the Whigs who championed Clay's "American System." Its aim was to promote and protect our manufacturing entrepreneurs and use tariff money to finance "internal improvements," a better term for roads and canals than our unsightly talk of "infrastructure." Welcome to Obama's New American System. As for coming battles, watch how Republicans deal with the president's call "to eliminate the billions in taxpayer dollars we currently give to oil companies" to pay for his innovation program. Defending big oil does not play well outside of Texas, Oklahoma, and Louisiana. Here is an Obama effort to split the business community and isolate a very Republican constituency. 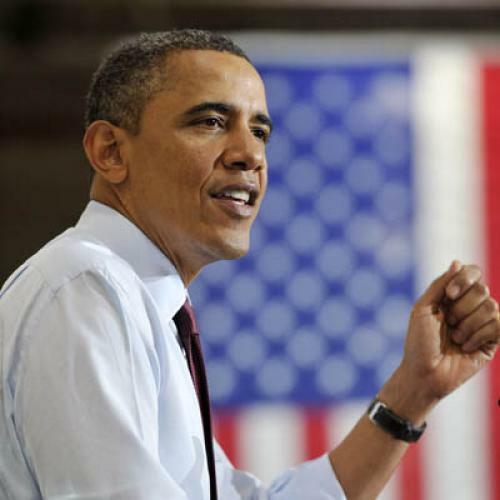 Business people emerged as heroes in Obama's America of "inventors and entrepreneurs." But the glory went to those who devise, make, and sell things, not to the finance jockeys of Wall Street. Business leaders like the useful endeavors Obama wants government to undertake. The president, in turn, hopes to enlist them to battle congressional Republicans who are mocking those "investment" initiatives as mere "spending." Even if he wanted to, Obama couldn't beat a unified business community. His bet is that business people tend to be conservative but not ideological. By bringing some CEOs to his side, he can isolate the GOP as a doctrinaire party uninterested in practical things. It will be the trickiest alliance of his presidency, but perhaps also the shrewdest.